Opinion Explainer: what is traumatic brain injury? Survivors of traumatic brain injuries might have behavioural issues or have problems holding down a job for years after a blow to the head or a bad fall, write Travis Wearne and Emily Trimmer. OPINION: Adam was fortunate to survive a major car accident three years ago. He was in hospital for several months but had no ongoing physical injuries. He looked like he made a full recovery. But he was argumentative, childish, vulgar and his family said he “was not the same person”. Adam had a severe traumatic brain injury. A traumatic brain injury is when the brain is damaged by an external mechanical force, like the type you may have in a car accident, if you fall, play sport or if you are assaulted. These injuries are usually in the news when sports players have a concussion; or in relation to drug and alcohol fuelled assaults where a blow to the head results in a damaging, sometimes fatal, fall to the ground (the coward’s punch or king hit). Mostly, it’s young adults, particularly men, who are affected. But many elderly people may get a traumatic brain injury when they fall. Australia has a growing population of survivors of traumatic brain injury. This is due to the young age of most victims and decreased death rates due to better treatment. Traumatic brain injury is expected to be a major cause of disability by 2020. Few traumatic brain injuries are the same and the outcomes of two similar injuries can be different in different people. Injuries can affect the way people think, feel, behave and relate to everyday situations. People with moderate to severe injuries can have problems communicating, paying attention, processing thoughts quickly, learning, remembering, planning, problem-solving, meeting goals, and thinking abstractly or flexibly. Damage to the part of the brain called the frontal lobes affects people’s ability to regulate their thoughts, emotions and behaviour. It can cause people to be impulsive, irritable, aggressive, have reduced drive, be apathetic, to have excessive emotions or a flattened mood. Difficulties understanding the emotions and intentions of others (known as social cognition) may cause reduced empathy and socially inappropriate behaviour. Reduced self-awareness can also result in lack of insight into their abilities and the changes others perceive. Traumatic brain injury can change an individual’s personality to the point where they “may no longer be the same person” that they were before. Given that many of these difficulties can occur without physical problems, they fall under the umbrella of an “invisible disability”. How does traumatic brain injury affect the brain? Injuries can be due to the immediate effect of the impact (known as primary injuries) or ones that follow these (secondary complications). Primary injuries include: lacerations, when the brain tissue is cut or torn; contusions, when the brain is bruised; rupturing of blood vessels; and axonal injury, where neurons are stretched and torn. These can occur where the object hits the head (a focal injury) or throughout the brain (diffuse injury). 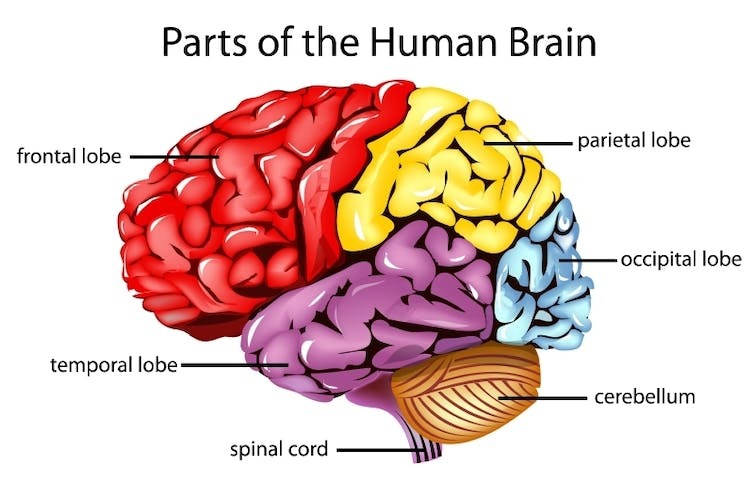 Parts of the brain known as the frontal and temporal lobes are most susceptible to both of these types of injuries. This is because of their large size and as they are close to the hard and uneven surfaces of the skull that can cause damage. Secondary complications include brain lesions (damaged brain tissue); brain swelling, increased intracranial pressure (pressure inside the skull), herniation (movement of brain tissue), tissue death, hypoxia (oxygen deprivation) and infection. How long someone loses consciousness initially and how long they’re confused for (known as post-traumatic amnesia) are used to classify traumatic brain injury as mild, moderate or severe. Most (about 80%) hospitalisations are for mild injuries. People with a traumatic brain injury can be treated while staying in hospital (as an in-patient) or after they’re discharged into the community (as an out-patient). In-patient rehabilitation focuses on immediate medical and functional issues, with a range of health professionals involved, like physiotherapists, speech pathologists, neuropsychologists (psychologists who specialise in assessing, diagnosing and treating disorders of the brain) and occupational therapists. Typically, a personalised rehabilitation plan is drawn up to help the patient to move back into the community. Out-patient rehabilitation focuses more on the context of daily living. Here, there is a shift to helping patients establish life roles and successfully complete everyday tasks, like making meals, showering and travelling. Recovery from a traumatic brain injury varies from person to person. Some people can easily resume their lives while others can struggle adjusting to their limitations, new lifestyle and new self. Some can have trouble living independently, fulfilling life goals and finding a meaningful place in society. Behavioural and emotional difficulties are significant barriers to long-term recovery. These challenges may not become obvious until the person is in the community, discharged from rehabilitation services and completely dependent on their carers and/or families. Behavioural and personality issues also make traumatic brain injury difficult to manage, placing burden on carers and result in difficulties finding and keeping a job. Family members and friends can pull away, leading to further social isolation and loneliness, making survivors more susceptible to mental health problems and institutionalisation. Sadly, these problems worsen as years pass, despite improvements made during early recovery. If you or someone you know is a survivor of traumatic brain injury, contact Brain Injury Australia, Synapse or the Centre for Research Excellence in Brain Recovery for more information and support. Travis Wearne is a Postdoctoral Research Fellow and Clinical Neuropsychology Registrar at UNSW and Emily Trimmer is a Postdoctoral Research Fellow in Psychology at UNSW.